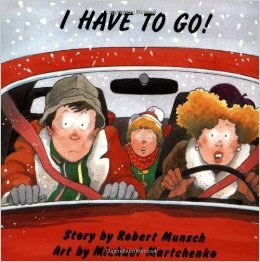 We so thoroughly enjoy the fun, quirky stories of Robert Munsch. Last night we read I Have to Go! and Purple, Green and Yellow for the first time. We can enjoy a huge library of picture books without having to check them out from the library. No late fines. No losing the book behind the couch. Through our library we can access TumbleBooks online which has narrated children's books with some animation where appropriate in the story. Sometimes the kids use TumbleBooks to hear a story on their own. Oftentimes, when we're reading altogether, I'll mute the narration and read it myself just as I would normally read a book. It's nice because we can enjoy a huge library of picture books -- some of which are remarkable -- without having to check them out from the library. No late fines. No losing the book behind the couch or in the back corner of somebody's closet. I Have to Go! is a hilarious story about a kid who has to go to the bathroom at the worst times. We clearly could relate. I overheard the children discussing afterward, wondering if he just "didn't know he had to go to the bathroom." Chris, my eight-year-old, and I enjoyed the absurdity while everyone got a kick out of the frequent use of the word pee. Highly recommend. 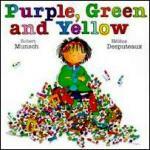 Purple, Green and Yellow has a less interesting cover image and title, so either I didn't notice it or I thought it was a book about colors. Chris requested to read this one for some reason, and we ended up loving it too. In it a little girl, Brigid, earns the responsibility of having a collection of permanent markers to color with. Just when the kids started to whine that nothing was happening -- on about the second page, I think -- the shenanigans began: Brigid colors herself with super permanent markers! Very fun. We even learned a new word: indelible. One word of caution might be in order. My children could relate to these books and found the stories silly -- as intended. I could imagine a child thinking that drawing on yourself and waiting to pee at the most inopportune times would get some laughs, and they might consider copying some of the scenarios in the books for this reason.